Google search: “What is clean eating?”. Answer: “ … At its simplest, clean eating is about eating whole foods, or ‘real’ foods — those that are un- or minimally processed, refined, and handled, making them as close to their natural form as possible.“. 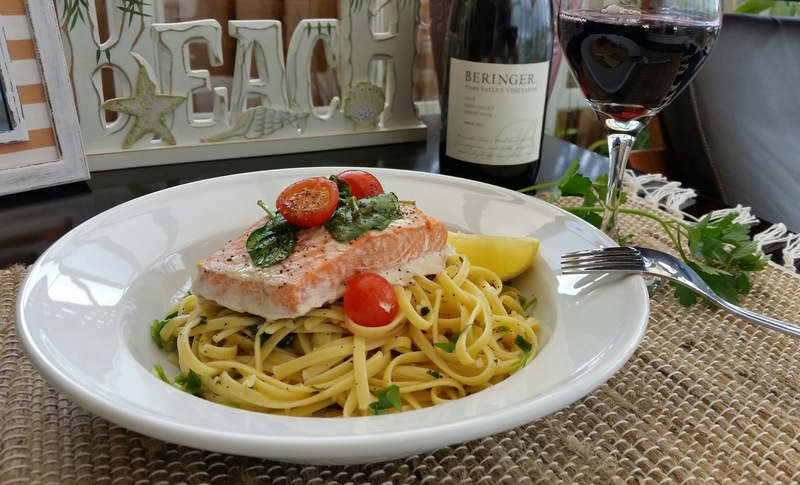 I guess this baked salmon linguine is as clean as I can possibly make it. It does tastes clean 🙂 and it is easy to prepare! Line a baking tray with aluminum foil. Rinse and place salmon pieces in the tray. Rub a few pinches of cornstarch on each piece of salmon. Sprinkle with salt and black pepper to taste. 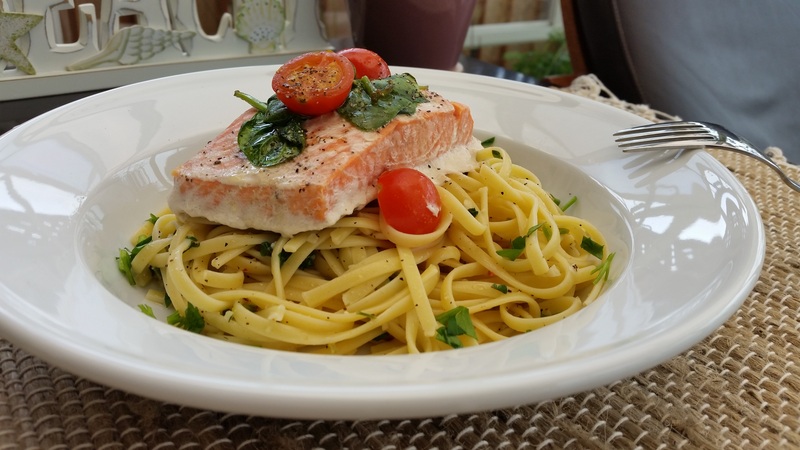 Arrange a few leaves of baby spinach on cherry tomatoes on each salmon. Cover the baking tray with aluminum foil and bake for 15 minutes until salmon is cooked through and spinach has wilted. Remove from oven. Set aside. Cook linguine according to package instruction. Add 1/2 Tbsp salt and drizzle some oil into the water for boiling pasta. 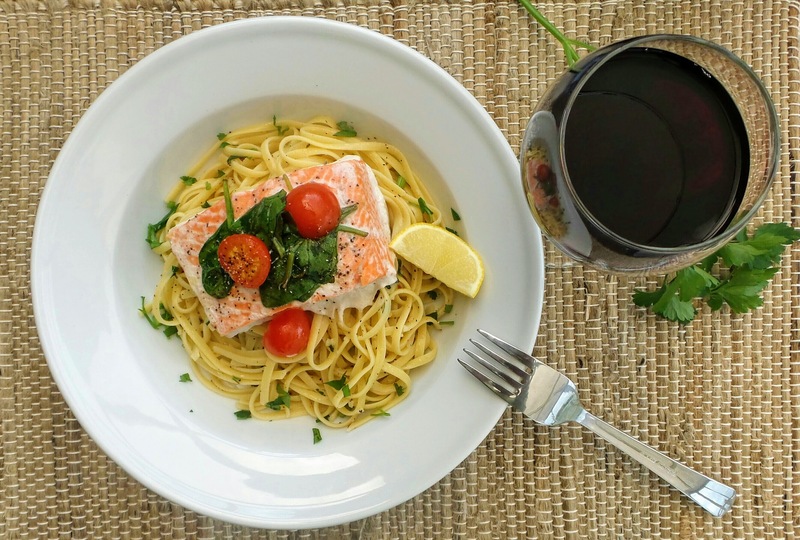 When linguine is cooked, rinse in cold water. Drain and set aside. Heat butter and olive oil in a large, heavy-bottom pan over medium-low heat. Add the salt, pepper, and minced garlic and saute for a minute. Remove from heat and stir in lemon juice, pepper flakes, chopped parley, and lemon zest until combined. Add the drained linguine back to the pot. Toss well.